To be honest, I have such a love-hate relationship with food. So this year, BALANCE should be first on my mind. I will work hard to get back to my weight 5 years ago but I will not deprive myself of little indulgences as a reward. In result, my first post of 2015 is a vegetarian dish. 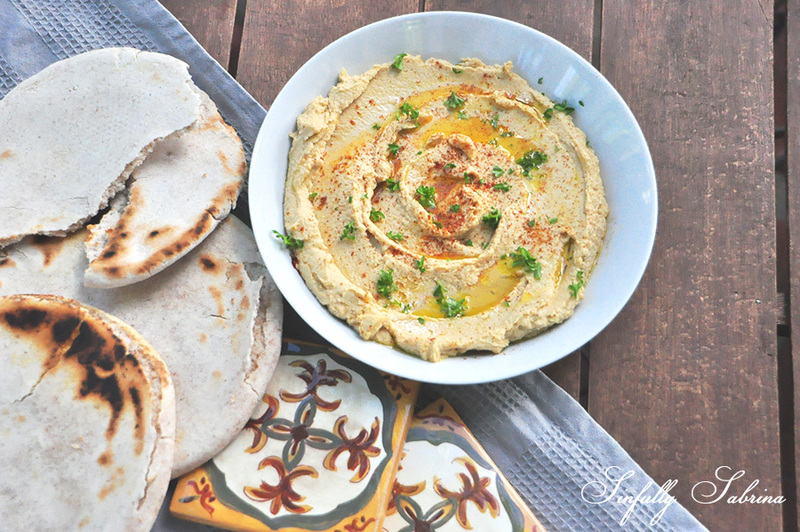 HUMMUS! Do not be fooled by this humble dip. It may look simple but the flavours are complex. It's rich, buttery and it also has a garlic-y bite. It's a great and easy snack idea when I crave for something savoury. I used pita bread here but vegetable sticks are a much healthier alternative. The hummus was also served during our New Year's Eve bash. It kept my guests satisfied while I made the finishing touches on the rest of the buffet. I'd love to hear what you guys served during your New Year's Eve bash, comment below or send me an email at sinfullysabrina@gmail.com. HAPPY 2015, it will be awesome for all of us!!! Serve with a drizzle of olive oil and sprinkle over top spanish paprika and chopped fresh parsley.